Results from the July 23 DCI Southwestern Championship in San Antonio, Texas determine the performance order for the DCI Atlanta Southeastern Championship. Jersey Surf was the only World Class corps that did not compete in San Antonio and as a result, the corps' most recent score from July 6 in Jackson, N.J. was figured into the scheduling process. Once seeded in score order, corps were drawn at random in groups of three (First through third, fourth through sixth, etc.) to determine the performance order. 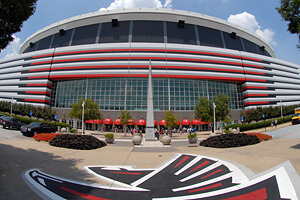 DCI Atlanta Southeastern Championship Presented by Lake Oconee and Greene County Georgia Atlanta Georgia Dome Saturday, July 30 1:30 PM – Gates Open 2:30 PM – Atlanta CorpsVets 2:47 PM – Alliance 3:04 PM – Jubal 3:21 PM – Pioneer 3:38 PM – Jersey Surf 3:55 PM – Teal Sound 4:12 PM – Mandarins 4:29 PM – Intermission 4:46 PM – Cascades 5:03 PM – Crossmen 5:20 PM – Pacific Crest 5:37 PM – Colts 5:54 PM – The Academy 6:11 PM – Glassmen 6:28 PM – Troopers 6:45 PM – Intermission 7:35 PM – Blue Knights 7:52 PM – Blue Stars 8:09 PM – Spirit of Atlanta 8:26 PM – Santa Clara Vanguard 8:43 PM – Boston Crusaders 9:00 PM – Madison Scouts 9:17 PM – Intermission 9:34 PM – Bluecoats 9:51 PM – Phantom Regiment 10:08 PM – Carolina Crown 10:25 PM – The Cavaliers 10:42 PM – The Cadets 10:59 PM – Blue Devils 11:19 PM – Awards Ceremony Eastern time zone. All times approximate and subject to change. Adjudication Panel Visual Effect – Tim Ochran Visual Effect 2 – Michael Stone Music Effect – Nola Jones Music Effect 2 – David Starnes Visual Performance – Michael Lentz Ensemble Visual – Deborah Torchia Color Guard – George Oliviero Brass Performance – Jeff Harper Ensemble Music – Jay Webb Percussion Performance – Martin Griffin Buy tickets to the DCI Southeastern Championship. View the complete 2011 DCI Tour Schedule.